"Downtown" Wailea Village is a pretty, if dilapidated, ghost town. At mile marker 15 north of Hilo, you must make a choice: left to Wailea or right to Hakalau. Hakalau is the postal address, but Wailea is a true ghost town. Both represent the kind of Old Hawaii you advise people to visit right away because it's likely to undergo major changes in the next decade. Akiko's Buddhist Bed & Breakfast: Contact Akiko Masuda via e-mail at msakiko@hawaii.rr.com. She can also offer more information about the Wailea Village Historic Preservation Community. Read: "Sugar Town" and "The Hamakua Coast," both from Watermark Publishing, whose owner Duane Kurisu grew up in Hamakua. Both entered the modern era as sugar towns. Wailea popped up in 1919 when Japanese businessman Tatsuji Kawachi visited, felt he could make money milling sugar cane from independent growers, and started Wailea Milling Co. That lasted 24 years. Both the railroad line and the offshore loading facilities were next door, at Hakalau, favoring C. Brewer's mill and company-owned fields there. 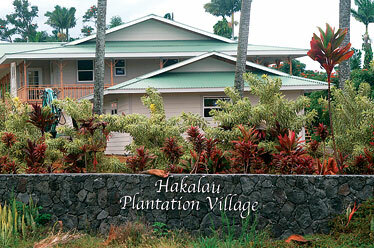 Hakalau fell on hard times in the past, but now a Richie Rich subdivision has sprung up under the name Hakalau Plantation Village. There's a post office and the old plantation manager's house, and some foundation material where a sugar mill sat on the shoreline. In 1944, Kawachi called it quits, sold most of his equipment to Brewer and went home to Hiroshima. The mill's long gone. It had once processed more than 5,500 tons of sugar a year. The decline of Wailea Village began and continued until the late 1980s. That's when an Oahu dancer and dance instructor by way of Farrington High School, Akiko Masuda, bought the Motonaga Garage, which had been in business there from 1935 to 1985. She turned it, along with adjacent properties, into Akiko's Buddhist Bed & Breakfast. The rustic premises appealed to tourists trying to escape from the modern, upscale B&Bs. High-end houses are going up at the former Hakalau plantation site. Akiko's is all there is in the way of accommodations. A Hawaiian adage applied to her B&B, which offers yoga and meditation classes, is "Hoolai na manu i ke aheahe," meaning, "The birds poise quietly in the gentle breeze." The phrase is applied to those said to be at peace with the world, undisturbed and always content. The B&B only marginally put Wailea back on the map. Most of the area economy still lay in farming higher up on Chin Chuck Road, named for a resident of an old sugar camp. Big Island Revealed guidebook editor Andrew Doughty wrote, "Nothing to see on Chin Chuck, we just like the name," the rationale he uses to include it on his Hamakua Coast map. There are two faces to Wailea Village. One comprises the elderly residents who have stayed there and the several dilapidated structures that give it its ghost-town character. The other is made up of newcomers, either recent buy-ins as properties skyrocketed in price, or renters willing to live in old houses at affordable rates. Masuda worried that the influx would result in demolition of the village, displacement of old-timers and the construction of inappropriate mansions or "gentlemen's farms." She's been the spark plug in setting up the Wailea Village Historic Preservation Community, a 501(c)3 nonprofit trust with a volunteer board of directors. The goal is to preserve and renovate old structures, create affordable housing and employment opportunities, and sponsor events that keep the humble plantation culture alive. Masuda says of staying in Wailea, "Maybe it's not totally in having lots to do and lots of places to see, but walking to places, sitting outside the garage gallery or in front of the Fujii Store and just talking story, or looking at the yards or watching the empty street. Going to bed when it gets dark and getting up with the sun and the birds." For me it's always been about taking a chair and sitting out on the yellow center line of Old Highway 19 at 5 p.m. and having my cocktail. The trust also collects money toward preserving that way of life, with the intent of buying properties that come on the market as residents age. One offering is to let the current occupants live out their remaining years in their houses. Then the property passes to the trust. But, of course, that will require an enormous infusion of cash. 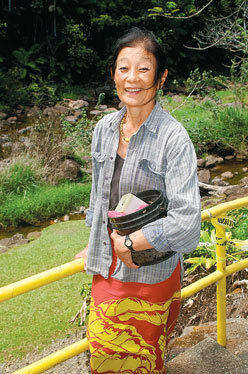 Akiko Masuda runs a B&B and heads a preservation trust. Meanwhile, the preservationists are working with the county to restore the old Hakalau Gym as a community center. It's now in such bad shape that it cannot be occupied safely. Masuda's art gallery in the old Motonaga Garage is the temporary venue for cultural exhibits, song fests, dancing and a hangout for talking story. For the past few years, the Hawaii County tourism arm has been supporting public events in Wailea and Hakalau such as mochi pounding, ghost storytelling (the next takes place Oct. 18) and a Japanese flute concert. The University of Hawaii and Aloha Green are exploring ways to bring students from around the world to participate in farming education and to learn Hawaiian cultural practices and do some restoration work on old Hawaiian structures in Hakalau Valley. Much of this is in the future. Currently, some old structures are scheduled for demolition, and it's inevitable that there will be other changes as well. Rentals tend to bring in younger people, and that usually brings more noise. There's been one recent, positive development in Wailea. Since 1936 the Fujii Bakery had operated in a 100-year-old building on the main road, old Highway 19, but it closed when all the nearby sugar plantations closed. Along came Aaron and Vinel Sugino. He grew up in Hakalau; she in nearby Honomu. They wanted to restart the Fujii family bakery but didn't have enough capital to bring the building up to code and install the kitchen. That's where the private, nonprofit Hawaii County Economic Opportunity Council came through with a grant for an "incubator kitchen," geared toward helping those with a good culinary business idea but whose home kitchens could never pass public health standards. Mauna Lani Resort was approached and agreed to donate about $100,000 worth of kitchen equipment. Fujii Bakery re-opened as the Blue Kalo Co., making taro chips, cookies and pies, much of it for sale in gift shops around the island and some of it displayed in Wailea for locals or tourists looking for omiyage gifts. Incubator kitchens are built to be shared by others who can rent time and equipment at the sites (there are some others on the Big Island), but the Suginos have definitely in at this one, and you can usually see Aaron's retired father, Wimpy, sitting on a bench, watching the occasional car go by. Ken and Rayna Armour moved to Wailea and took over an expiring orchid business. They had no orchid business knowledge, but they agreed to employ the previous owner's Filipino workers. A neighbor says "they even scolded their dogs for barking at people." Such things make for good neighbors in Wailea. As for what a visitor might do in Wailea-Hakalau, first, forget about your cell phone. There's no reception in town, but you might pick up some bars if you head to the county park at the edge of Wailea and stand near the makai-most fence. Hilo's just 15 quick miles to the south, and Laupahoehoe six miles to the north with its historic park on the point and the Back to the '50s Cafe in town. Four miles north is Ninole and its Waikaumalo Park with a spotless pavilion, picnic tables, clean bathrooms and electricity, right on the edge of a flowing stream. The Hakalau road makai winds down under an old train trestle and ends at a small bay where you can see the foundation remains of the Hakalau mill. That valley is filled with blooming African tulip trees. As you watch the waves crash, you can imagine how hard it must have been in the 1920s to load raw sugar onto small craft that took it out to large ships waiting offshore. Later, the sugar would travel by train, then by road. Just a mile south of Wailea Village, old Highway 19 winds down into the gulch and the marked entrance to the county's Kolekole Park, which draws mixed reviews from users. It's on the ocean and on a stream with a waterfall right across from picnic tables. There's one pavilion that allows you to take shelter in bad weather (or shade), and some small shelters, but the park tends to draw homeless people, alcoholics and drug users. You can pitch a tent there with a county permit, but the night denizens tend to scare would-be campers. It's better to camp at Laupahoehoe Point, which has better facilities, better views, swimming at the boat ramp if the waves aren't too high, and a store up in the village. From here you're only a short distance to Akaka Falls and the World Botanical Garden. 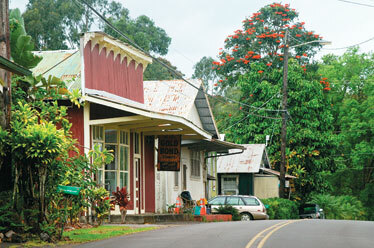 Or you can make a day of traveling northward to Honokaa with its many antique shops and small restaurants. The Honokaa Club rents basic rooms, some with an ocean view. Bring lots of books. Wailea is a place to hang out, commune with nature, listen to sounds, look at stars not hidden by light pollution and read. Then read some more. Masuda also offers, "What will keep Wailea-Hakalau thriving during this period of transition is an intentional focus to connect residents with aloha, with caring, with gatherings and education and helping where there is need. Kind of like the old kumiai system, where when someone died, the community would come together to kokua. The women made the food; the men built the coffin and handled the burial. And this system applied to any family in need, and you become obligated to kokua when someone else was in need." Bob Jones is a MidWeek columnist. He can be contacted at BanyanHouse@hula.net.